Sri Lanka captain Angelo Mathews was left to rue the failure of his inexperienced batting line-up to adjust to swing condition after crashing to a massive innings and 88-run defeat to England inside three days in the opening Test match inside at Headingley. 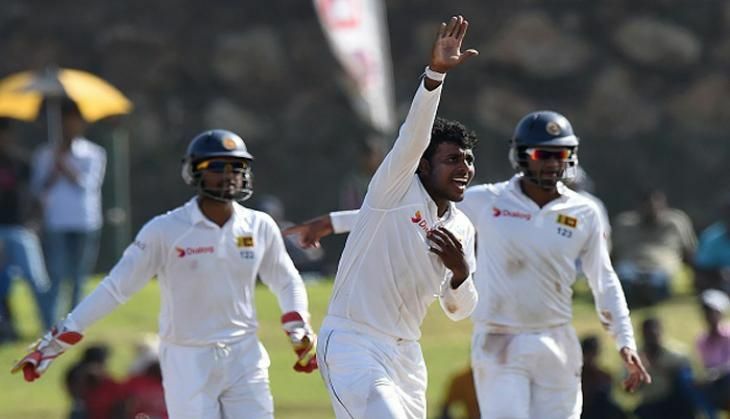 Chasing England's first innings total of 298, Sri Lanka collapsed to 91 before bundling out for 119 following on. The tourists lost 13 wickets behind the stumps on the off side. England paceman James Anderson bagged 10 wickets overall in the match, while wicketkeeper-batsman Jonathan Bairstow was named man-of-the-match for making 140 besides taking nine catches in the game. "We were not decisive in leaving the ball," Mathews was quoted as saying by ESPNcricinfo. "They bowled in good areas and we just kept putting our bats out of line of the stumps, and it kept nicking our bats all the time. We have to be decisive and play the correct one." "It was quite an embarrassing defeat. It was pure poor batting and the execution. You have to be really skillful to bat against these guys, especially in these conditions. Anderson once again showed his class. Stuart Broad was brilliant as well. One or two of our guys needed to raise our hands and put up a good score, particularly in the first innings. We failed to do that in the first innings, and once again in the second innings, so that's a pretty obvious reason for our defeat." The captain, however, believes that his side have the ability to bounce back despite enduring a nightmarish start to the series. "We have done it in the past. We have a couple of days to regroup, think about our strategy, train really hard and come back hard. All we've got to do is change our mindset. If you believe you can do it. Yes, it was a humiliating defeat. It was embarrassing. But if you stick to our plans in the second game we could turn the tables around," Mathews said. With the win, England lead the three-match series 1-0 and will next take on Sri Lanka at Chester-le-Street in the second Test.